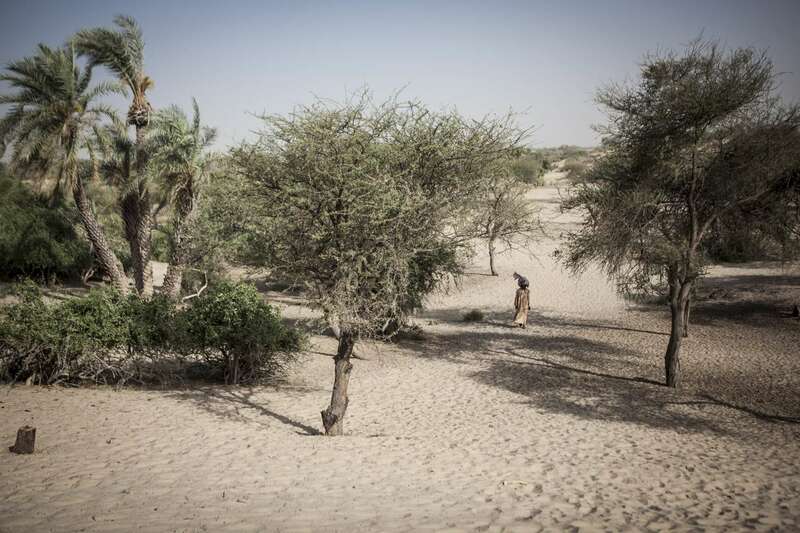 Amadou Allay, 22, walks through an area of the Lake Chad basin that was once covered in water over 30 years ago, but has now been overtaken by sand, in Broumbya Village outside of Baga Sola, Chad on February 15, 2017. Villagers recalled building a dyke to separate the water from farmland but as years passed, the farmland began to dry and the shores of the lake began to recede and now all that remain are sand and desert succulents. Present day Broumbya Village lies over 4km away from the shores of the lake and the distance continues to grow as the desert encroaches the basin. Due to recent security constraints villagers cannot move to find new farmland therefore they must rely on irregular food distributions from under funded aid organizations.